We had a lot of fun playing with some old crayons the other day. Kaitlyn sorted them into colors and chose her two favorites red and purple. We peeled back the paper and placed them into a clear ziploc bag. 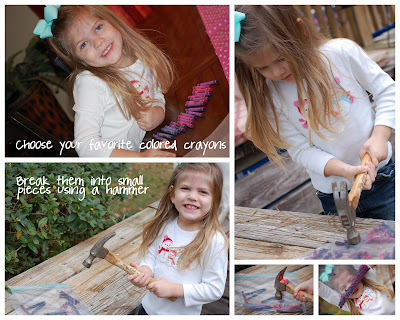 She practiced her hand eye coordination by using the hammer to smash the crayons inside the bag...I have to say she is pretty good at swinging the hammer, I see lots of DIY projects in her future. 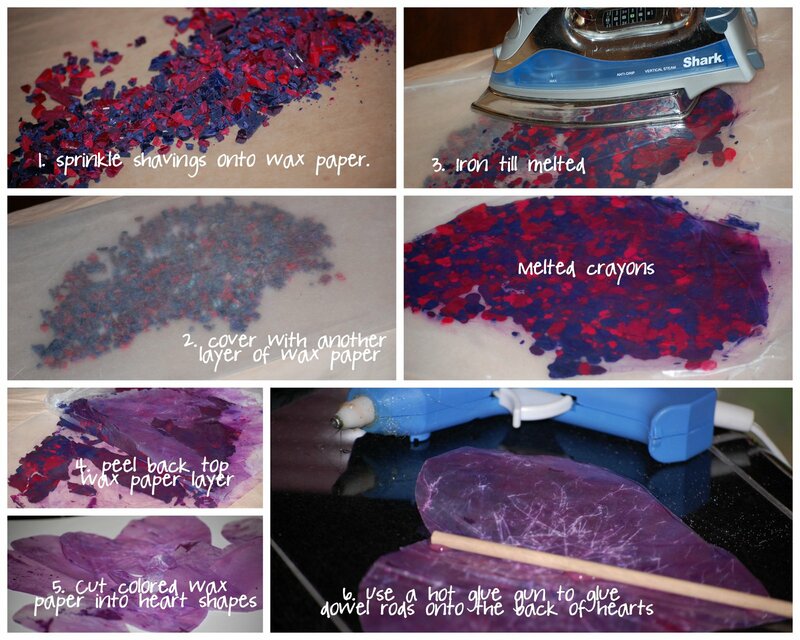 Next we sprinkled the smashed crayon pieces onto a layer of wax paper, then covered it with another layer. I used the iron...on a medium setting.... to iron the wax paper melting the crayons. Once the color had transferred onto the wax paper I placed the left over crayon pieces into a ziploc bag to keep for future projects. Kaitlyn helped me trace some hearts I cut out of old file folders and then I cut the hearts out for her. I glued wooden dowels onto the back of each heart using a hot glue gun. added a little tuelle ribbon for grass in a small pot and viola...a heart bouquet!